Built in 1853, this Federal style house was the home of James Franklin, a private banker. The original structure consisted of four over four rooms. The two additional rooms to the right were added just before the turn of the century. 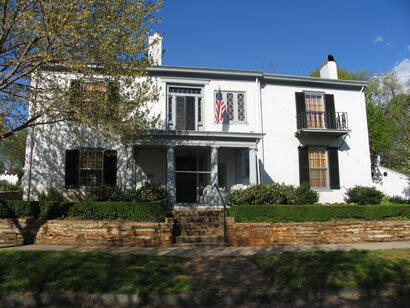 During the 1850s, this home was occupied by the family of John W. Murrell. Note the cast iron balcony. This residence received the Lynchburg Historical Foundation Merit Award in 1987 for extensive interior renovation and was an Honorable Mention in 1997 for the dry stack wall, carriage light posts and carriage house garage additions to the side property.